I cannot count the number of Mac using Lulu customers who have said, "What's the matter with your printer? My PDF looks perfect to me. Hey, I even printed it on my desktop printer and it prints fine too. Fix your printer!" The reality is that PDFs that display fine can be faulty internally. Adobe Reader, the Mac Preview application and Acrobat are often able to display with PDFs that have faulty font embeddings. That can fool us into believing that nothing is wrong with the internals of the PDF. However, high speed commercial digital printers do not print your PDF from Acrobat or Adobe Reader. They process the PDF with software that demands properly formatted font embeddings and then print that processed file. We are working with our print partners to improve the success of printing with Mac-made PDFs, but it will always be important to use the best methods for creating a print-ready PDF. 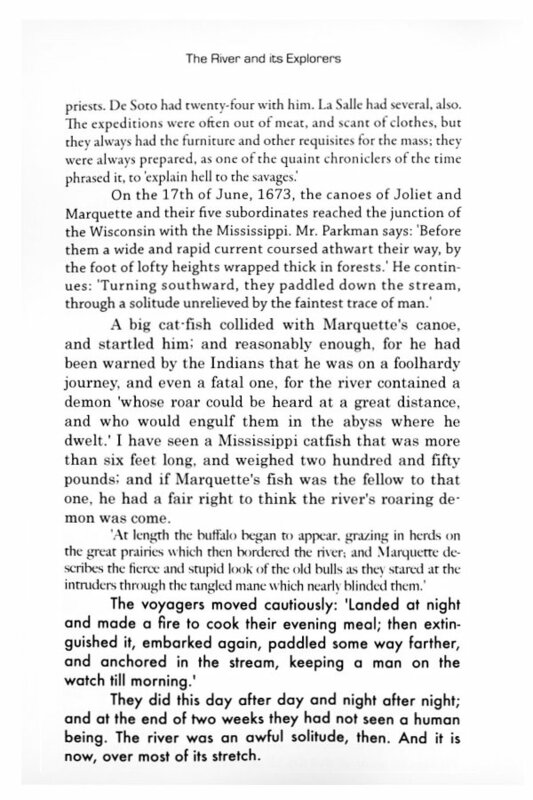 The image below was scanned from a book that was formatted on a Mac. The original source file was saved as PostScript from a Mac publishing application. That PostScript file was uploaded to Lulu and converted at Lulu into the print-ready PDF that was then printed. 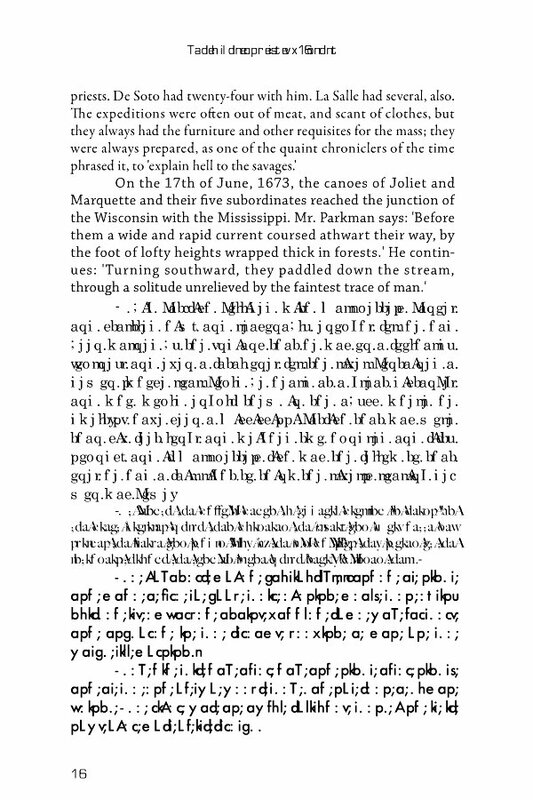 In the full book over 25 fonts were embedded several times each. This book printed without any font or formatting errors. In short the printed book looked identical to the print-ready PDF. The image below was scanned from the corresponding page of a book made from the same source file. In this example, the identical PostScript file was converted to PDF by opening it in the Mac application "Preview" and then saving it as a PDF/X3 file. The book was printed with font and formatting errors on every page. Similar font and formatting issues were found in all the test books I created using the Mac "Preview" application. I recommend against using Preview to create PDFs for printing at Lulu. 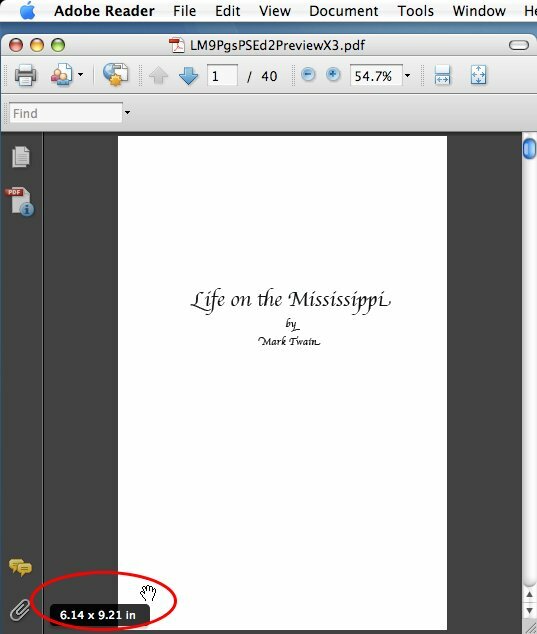 Before you order a copy of your new book, you should thoroughly check your PDF. That may be a little tedious but the time you spend might save you something more valuable than the money spent on a bad book: it can save you a lot of time. Open your PDF in the free Adobe Reader application or in Acrobat. Do not use the Mac Preview application for this step. Step one is to check the page size of your PDF. This is illustrated below: drag your cursor down to the lower left corner of your opened file. The page size appears as is shown in the red oval. 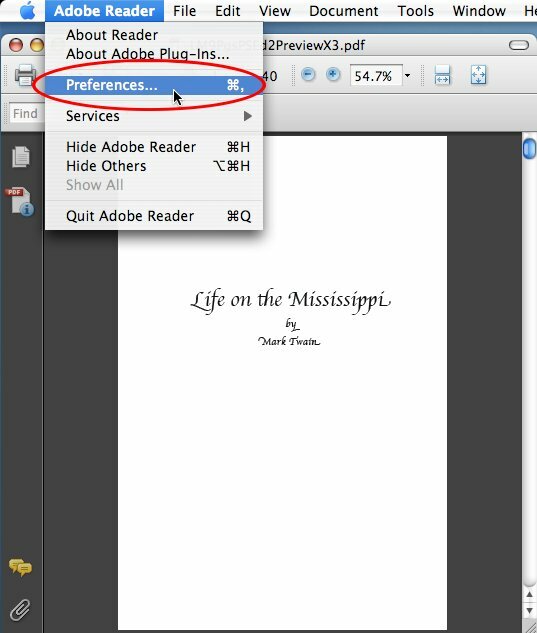 Now, you want to set the Adobe Reader (or Acrobat) "Preferences." Click on Adobe Reader, then on Preferences. From the Preferences menu, choose Page Display and UNCHECK the "Use local fonts" box. This keeps Adobe Reader from "borrowing" fonts on your computer to use in the display. It allows you to view the PDF as it would display on another computer that does not have all the fonts you have on your system. With "Use local fonts" unchecked, look over your PDF page by page and check fonts and formatting carefully. Another way to check your book before ordering a print is to create a Lulu Preview. Confusingly, the word "preview" is used in several different ways in the Lulu world. The preview I mean here is the one you create for showcasing your book on your Lulu storefront. It is lower in resolution than your print-ready PDF, but it has an interesting advantage for Mac users: the preview can warn you of the kind of font embedding issues that are common in PDFs made within Macs. For a relatively short book it is practical to make a preview of the whole book. You can change it back to a few pages once you have examined it over for font issues. It need not ever be available to the public because you can do this all before making the book available for sale. Click on your project from the My Lulu page or from the My Projects listing. You should then be on a page that says, "Revise:" followed by your book's name. 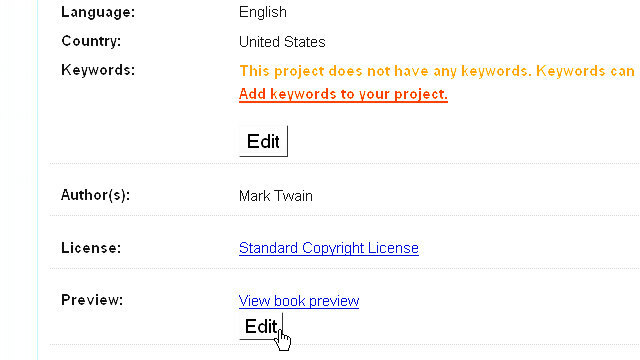 Down the page, in the section titled "Preview" click on "Edit." Check the button that says "Design your own." I chose "Entire book" to check all 40 pages for embedding. When you look at the preview, you should see your text formatted as it was in the print-ready PDF. The example preview below is from the same book shown in the first scan at the top of the page. The PDF was created by saving a PostScript file from the publishing application, uploading that PostScript file to Lulu and converting it to PDF using the Lulu converter. 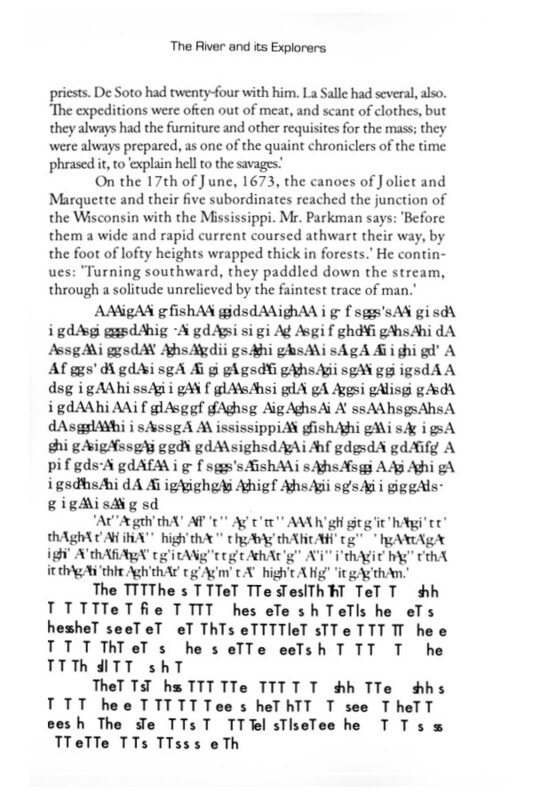 In the full book, over 25 fonts were embedded several times each. Paging through this preview, all the pages looked like the corresponding pages of the print-ready PDF. As seen in the first scan above, the book also printed perfectly. The example below is the corresponding page from the preview of the book that is also shown in the second scan at the top of this page. It is from a PDF that was made by converting the PostScript file in the Mac "Preview" application. 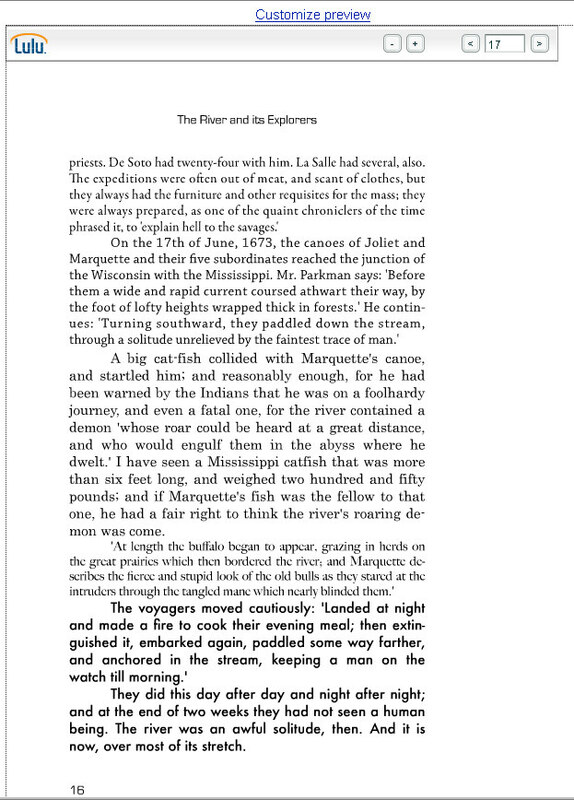 Every page in the Lulu preview has font errors just as the second scan at the top of this page shows that every page in the printed book has font errors..
Notice that the misprinted characters are different in the Lulu Preview than the corresponding characters in the scans of the printed pages. In spite of the difference, it is the same blocks of text that are affected. Something in the Preview generation process is affected by the Mac font embedding in a similar way as is the printed version. 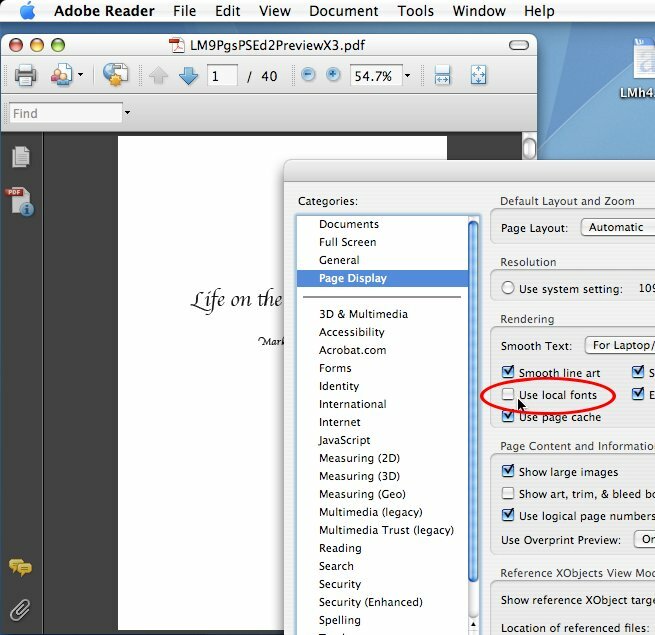 Save as PostScript from the Mac "Print" menu and then upload that PostScript file to Lulu for conversion to PDF. Alternatively, convert that PostScript file using Acrobat's Distiller application or by uploading the PostScript file to Adobe's Create PDF Online system. Avoid the involvement of the Mac application "Preview." Use Adobe Reader to check the page size and formatting. Create a Lulu Preview and see if the fonts remain readable. The Lulu Preview is not a precise test. If the preview shows faulty font encoding, do not purchase a copy until you get a PDF that makes a readable preview. However, a good looking Lulu Preview is not a guarantee that the book will print perfectly. Always order a proof copy to test the printing of your PDF before you make the book available for purchase and before ordering the book in quantity.